This entry was posted in July 2018 on July 21, 2018 by Newsletter Editor. Fishing Clubs along the west coast of the North Island are looking at doing a satellite tagging campaign during the 2018/19 season. The plan is to release 6 tagged Striped Marlin along the west coast during 208/19. Sponsors for 3 tags are confirmed, and potential sponsors for the other 3 tags are being sought. If you are potentially interested in sponsoring a tag ($4500USD) (or contributing to/sharing a tag) please email steelykiwi@gmail.com for more information. If you have a trophy can you please arrange to get your trophy back to the club so we have time to have it engraved for next prize giving. This entry was posted in July 2018, June 2018, Newsletters on July 2, 2018 by Newsletter Editor. Ahipara Gamefish Club May 10th – Club member Craig Rogers braved the elements recently, fishing off Ninety Mile Beach. He caught a nice Snapper est. 12Kg and being a Conservationist type of guy let this breeder go back. He has also caught a few around the 8kg weight. Well done Craig. Ninety Mile Beach rocks. Kawhia Boating & Angling Club Inc – May 6 – Congratulations to angler Max Gilbert, skipper Luke Gilbert and the crew on board Albatross for tag & releasing a Broadbill Swordfish yesterday. It was caught at the Mokau Trench and it’s estimated weight was 170 kg. Well done guys. Marsden Cove – Congratulations to Sean McCully and Mike McCully who landed a 201.4kg Striped Marlin off Ocean Beach, Baits in the water at 9, hooked up 5 mins later then back in before 12 to weigh the fish 😎 game fishing doesn’t get much better than that ! Mercury Bay Game Fishing Club – April 25 – 2 fantastic catches of Broadbill weighed in Mercury Bay this evening. Well done to those involved. Muriwai Sports Fishing Club April 22 – How cool is this! Matt Dodd was on daycare duty on Friday and decided fishing was a good plan. Result was young Josh having a battle he’ll remember forever, landing a 152kg stripey. Dad at the helm, Luke Nobilo on the leader and wee Sophie sleeping through the whole thing. Whangarei Deep Sea Anglers Club – April 16 – Congratulations to Oscar Newport on Bushido, Noel Kingham on Outahere and Stuart Moore on Whiplash – a Striped Marlin each today!! And it’s Congratulations and HAPPY BIRTHDAY to Wynne Goingfishing on his own boat GPS – a Striped Marlin landed on just 10kg line – Not bad on your 88th birthday huh!! This is different! Tony Carpenter is doing what he does best and caught a Sunfish, as by catch, in 500 metres! These unique fish are more commonly encountered, on or near, the surface and none of the crew at Shimano have heard of one caught on a rod and reel before!! Hooked in the corner of the mouth and released to “fight another day” Oh and the lads caught another sword today as well! This entry was posted in Club News, July 2018, NZSFC on July 2, 2018 by Taryn Olsen. Later this week, the NZRFC will be sending out their annual invoices and we are seeking your continued support, through membership donation, to ensure the ongoing representation and advocacy work of the Council. A lot of good work is being done by many other recreational fishing advocacy groups, and this must continue if we are to gain Ministerial support for our sector. The NZ Recreational Fishing Council (NZRFC) are not heard or seen as often, but do spend a significant amount of time researching and working on submissions, lobbying government officials and negotiating for an appropriate share of the New Zealand fishery. Our latest initiative is to host the first Fisheries NZ Forum 2018 later this year and expressions of interest are being called for so that planning can get underway to finalise the nature and shape of the event. The format will be structured in a way that representatives from all sectors; commercial, customary, regulatory, boat clubs and recreational will share ideas and communicate their key issues with a view to developing long term resolutions in partnership. Read more about this new initiative below. You can join the NZRFC mailing list using this sign up form. Please forward this newsletter to people you think will be interested. Visit our updated website www.recfish.co.nz for more updates and news. We also now have a Facebook page to encourage dialogue with members throughout the country. Seven rock lobster stocks are managed with operational management procedures (MPs): CRA 6 and CRA 9 are managed without one. Use of Management Procedures to manage New Zealand lobster stocks coupled to the CPUE data is seen as the most cost effective and responsive way to manage rock lobster extractions. However, there are exceptions. The MP for CRA 9 was abandoned in 2015 when the NRLMG accepted advice that CPUE was not a reliable index of abundance for this stock. How can you trust CPUE as an index of abundance? First – because a significant amount of work goes into estimating CPUE from the raw data: the data are processed to remove errors, then “standardised” to remove the effects of season and area. Projects have looked (they continue to look) at potential problems caused by changes in fishing patterns, high-grading and holding pots, to assure us that the best procedures are being used to produce CPUE. Second – because CPUE appears to be an index of abundance. It shows long periods of increase or decrease; it doesn’t show a lot of variation around the medium-term trend, so it’s not a noisy index. The CPUE trends concur with trends in size distributions, supporting the idea that it is an index of abundance. CPUE is affected by lots of things in the short-term: where you fish, bait, the moon, the season, the weather, how you fish, and lots of other things. The input to a management procedure is from a whole year of commercial potting data, analysed in combination with all the previous years, and a lot of the short-term effects cancel themselves out. Third – both commercial and non-commercial fishermen use CPUE themselves: when things are bad they “can’t catch fish”. Fourth – stock assessment results show that CPUE has the same signal as other data sets. Aren’t you worried that commercial fishermen might manipulate CPUE? No. First – there are huge penalties for commercial fishermen not providing the data accurately. Second – it’s in the best interests of the commercial industry to report CPUE accurately, so that the stock remains healthy. Third – repeatedly, when a cut could have been averted by manipulating CPUE, it hasn’t happened. While the NZRFC recommended that the CRA2 fishery be closed to get all pots and divers out of the water, thus exposing the illegal catch. This was a bold decision based on the CPUE and research showing that this fishery is just bordering on the hard limit in an effort ensure a rapid rebuild and sustainability. In an effort to ensure that the many small fishermen survive, the recent Ministers decision has seen the TAC for CRA2 reduced significantly to 193tonne. The TACC has subsequently been set at 100t a 50% reduction with the recreation allowance set at 34t a 76% reduction. There was no change in the Customary allowance. The goal is to constrain recreational removals to the new 34 tonne allowance (on average) until increased stock abundance enables consideration of a TAC increase. At this point we have been assured and it is recorded in the NRLMG records that when the TAC is increased and the TACC is increased the allowance for recreational will also increase. This is to respect the shared pain – shared gain philosophy on the management group. Fisheries New Zealand and the NRLMG also consider that the most effective measure to manage recreational catch to the new 34 tonne allowance over the next few years is to reduce the recreational daily bag limit to three rock lobsters per person. This has been supported with some reservations. A major goal is to minimise illegal removals to ensure fish thieves do not compromise the rebuild and the rebuild accrues to legitimate fishers. So along with an increased enforcement and compliance focus on CRA2, Fisheries New Zealand and the NRLMG propose to introduce telson clipping for recreational fishers. Recreational fishers will be required to clip at least the last third of the middle part of the tail fan (the “telson”) (end of the tail) once they have taken a lobster. This marks a lobster as being recreationally caught, and so is not permitted to be brought, bartered or traded. Telson clipping is expected to help address the illegal take and sale of rock lobsters on the domestic market by non-commercial fishers and fish thieves. This will not hurt the lobster or change the taste. In support of this initiative Kaitiaki will be requested to make telson clipping a condition of permit to assist in identifying lobsters customary use only. Fisheries New Zealand has announced the results of the second phase of public engagement in the development of the National Blue Cod Strategy. “We had 1,182 responses to the second online survey from all over New Zealand, and around 150 people also came along to the nine drop in sessions we held throughout the South Island. “The majority of respondents were very supportive of the proposed approaches, as well as the objectives of the strategy. In particular, we had strong support for the proposed introduction of a traffic light system to show how fisheries are performing at a local level. “The final strategy, based on all the conversations and information we have gathered, will be released in the coming months. Following the release of the strategy it is likely some immediate changes to the rules and limits for blue cod will be consulted on,” Mr Halley says. Te Whānau a Kauaetangohia Hapū has applied for a mātaitai reserve at Cape Runaway in the Bay of Plenty. The hapū is seeking approval to create the Kauaetangohia Mātaitai Reserve. Mātaitai reserves are areas closed to commercial fishing that may have bylaws affecting recreational and customary fishing. Keith Ingram and Margaret Wind recently met with John Taunton-Clark | Principal Analyst, Fisheries Management last month, to discuss this important subject. FNZ plan to release documents for consultation mid June, with submissions due around mid-July and decisions expected in September. This review includes all species and is relevant to all fishers in NZ. The Council will be seeking your input into the submission, once discussion documents are released. Standby for more information on this soon. The Nature Conservancy (TNC) and Recreational Fisheries Project – what is it? Contributions to MPI’s development and implementation of an Integrated Electronic Monitoring and Reporting System for commercial fishing vessels. Partnering with multiple groups, including Revive our Gulf, Iwi, and the University of Auckland, who are working to advance the green-lipped mussel reef restoration project in the Hauraki Gulf that supports fisheries production and other ecosystem services. Addressing a range of issues related to the management of shared fisheries. These issues will be addressed through the recreational fisheries project, which will also pursue partnership opportunities to restore shellfish beds and other nearshore habitats outside the Hauraki Gulf. Rocketlab will be sending the Council a ‘Notice of Launch’ for any upcoming missions which we will send out to all members in future. There is a launch due to take place in the Mahia Peninsular area this week if weather permits. This is relevant to any fishers, operators, agents and vessels that may be transiting the area. If any operators or fishers have questions, please feel free to contact the Launch Safety Operations Manager on j.dreyer@rocketlab.co.nz, or if in the vicinity of Mahia during Launch days, contact Rocket Lab Range Control on VHF 07. Maritime NZ has issued the attached safety bulletin: Life jackets with kapok-filling or cotton straps could fail when used. These life jackets are unsafe and should be replaced with new life jackets as soon as possible. Old unsafe lifejackets should be destroyed so that they cannot be re-used or on-sold. Please read the attached bulletin carefully, then forward it to your organisation’s members encouraging them to work with the masters or skippers of all their vessels and managers responsible for safety so they can “check, replace, destroy” the unsafe lifejackets. Fisheries New Zealand has started public consultation on catch limits for North Island freshwater eels. This includes the shortfin eel and the longfin eel in all Quota Management Areas across the North Island. Fisheries New Zealand Inshore Fisheries Manager Steve Halley says the review is based on a new scientific assessment by NIWA in 2017 for North Island eels. “The scientific assessment has been reviewed through Fisheries New Zealand’s science review process by independent experts, and we are now using that information to look at how we manage this fishery going forward,” says Mr Halley. “The latest scientific information is showing shortfin eel stocks in the North Island are at sustainable levels, so we are proposing no changes to the catch limits. “There are two options for longfin eels. The first would keep the catch limits for each stock at its current level. “The second reduces catch limits across all North Island stocks. This takes into account the biological vulnerability of longfin eels, and that some longfin eel stocks, while stable, may not be showing a clear increase in abundance. It also responds to concerns raised during discussion with iwi, stakeholders and public feedback about longfin eels. “Following public consultation, we will provide the Minister of Fisheries with final advice, so that any catch limit changes can be notified prior to the start of the new fishing year for eels, which is 1 October 2018,” Mr Halley says. The consultation document and information about how to have your say is available on the Fisheries New Zealand web page: https://www.mpi.govt.nz/news-and-resources/consultations/review-of-north-island-eel-sustainability-measures-for-1-october-2018. We are currently investigating the option of a Fisheries NZ Forum; a one day meeting that will be all inclusive in an effort to open up meaningful dialogue across all sectors in the shared NZ fishery. Invitations will be sent out to representatives from the commercial, customary, regulatory, recreational and clubs – if you are keen to be a part of this forum, please contact margaret@safeship.co.nz to register your interest. Subject matters for the first forum would include Ocean Farms, Aquaculture growth, Blue Cod, Southern Blue Fin Tuna, Rock Lobster, Terakihi, shared fisheries, and the environmental impact on fishing. 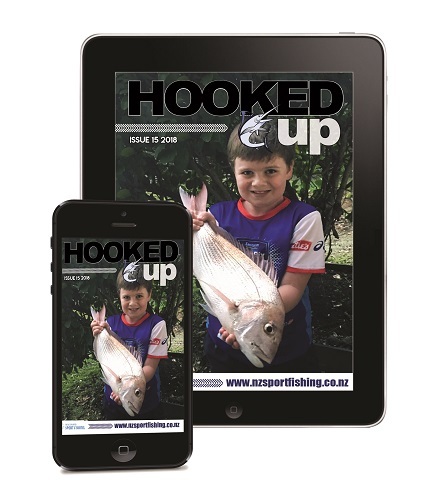 Please find enclosed the latest Hooked Up magazine. Fisheries New Zealand has proposed a further temporary closure of the Southern Scallop fishery, SCA 7 and Port Underwood. (See attached). The temporary closure would be for the 2018 season starting on 15 July. The closure will apply to commercial and recreational harvesting of scallops. The Southern Scallop fishery has been closed for the past two seasons. Attached is a summary of the proposals and draft recommendations from the NZSFC Fisheries Management Sub-committee. Read it here. Submission deadline to Fisheries New Zealand is 25 June. Deadline for any comments to the Fisheries Management team is 21 June 2018.